Giving gifts to family and friends during the Christmas season is a tradition followed by most people, regardless of their beliefs. Although the Wise Men figure prominently as historical gift givers, it is God who “so loved the world that he gave” the Gift of Christmas - Jesus. This tiny baby, God’s own Son, came to our world bringing hope and salvation to all who would believe. It is this amazing love that inspires us to give gifts to each other out of gratitude and joy. When I married my husband David, I was introduced to his wonderful family tradition for opening gifts at Christmastime. It included reciting the Christmas story from Luke 2 prior to opening presents, bringing focus to Jesus as God’s gift to the world. I loved how this practice created a pause for gratitude and reflection, which added rich meaning to our time of gift giving. As our family grew, we continued to read Luke 2:1-20 and sing a few Christmas carols before our gift opening each Christmas. Students or friends whose homes were too far for travel were often invited to join us. If they were not people of faith, I often wondered if they minded sitting and listening - or if our practice made them feel left out. When our children grew up and began bringing home special friends, I wondered how it might look to include everyone in this tradition in a way that would be comfortable for all and help them feel part of the family. 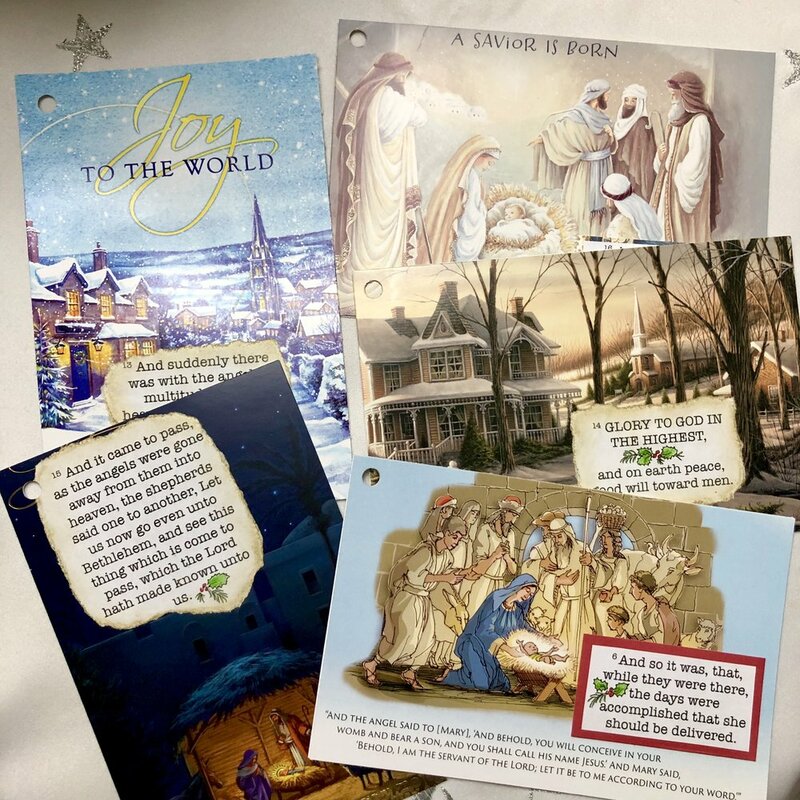 We needed to have something on hand that would help us point to Jesus and enable each person to participate - something that would be a visual reminder for keeping the tradition, a “hands-on” faith tool for all ages, and a treasured memory for our children and grandchildren. In thinking about what it would sound like, what if each verse from Luke 2:1-20 could be typed up separately so that the voices of all - young and old, family and friend, faithful or seeking - could be heard proclaiming the precious account of Jesus’ birth to each other? These are the supplies you will need - making this project simple and affordable ! The project involves making a series of hole-punched cards that can be organized onto an “O” ring and then handed out for reading. 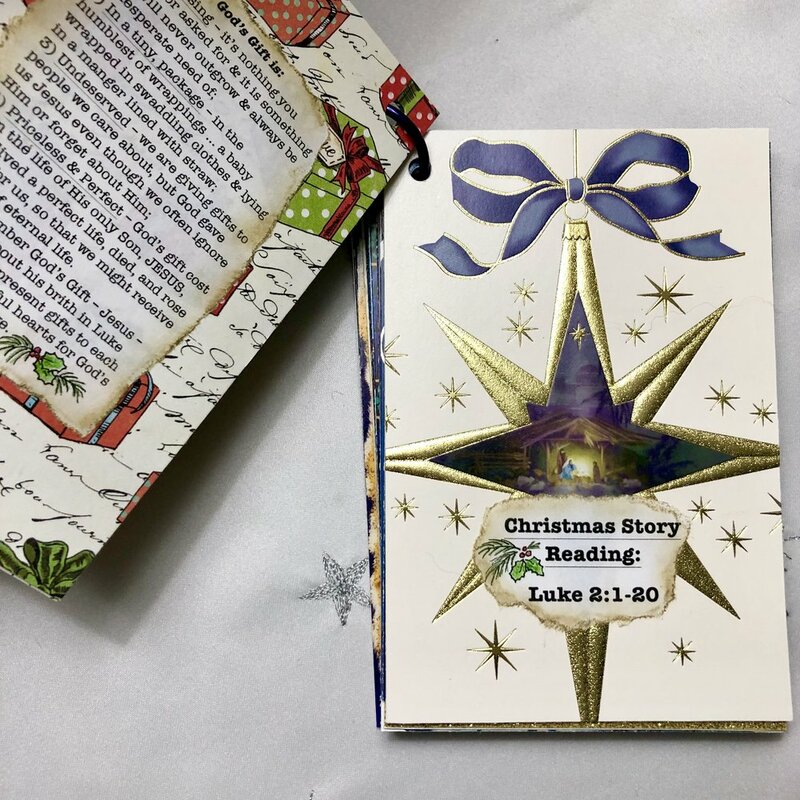 An inexpensive white 4 x 6 index card is used as the base; old Christmas cards and scrapbook paper are cut to size to decorate the front and back and affixed with double-sided tape. (You can also use a glue stick.) You could omit the index card, however, it adds a nice sturdiness to the cards. The verses, words of explanation, and prayer are printed out and then torn or cut out to add to each card. Tearing around the words creates a vintage effect and is fun for children. A bit of distress ink dabbed around the edges adds visual appeal, or you might add a thin line of gold gelato and blend with a sponge (pictured). Punch a hole in the upper left-hand corner of the card, assemble on an “O” ring, and add some yarn and ribbon embellishment if desired. For the cover, choose a card that takes your breath away (because then you will see it every year!) I loved the rich hues of this image and added ribbons and yarn in similar colors. Some explanation and words to bring focus…. Scrapbook paper adds visual appeal to the back of each card. The explanation and optional idea for carol singing fit well on the back of the cover. The second card provides words to share prior to the reading of the Christmas story - words to reflect on and call hearts to focus on the Christ Child. This is not meant to be scripted - a family leader may choose their own words - but for those who are not sure or who are new to the faith this may provide needed support. More words describing God’s Gift may be added to the back of the focus card - these are especially appropriate for an older crowd. 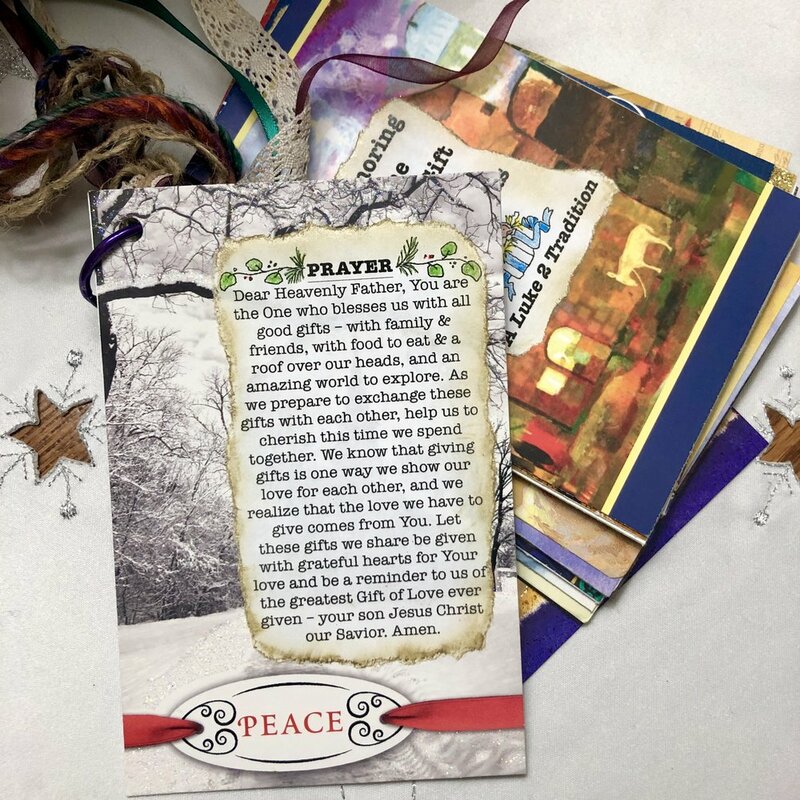 As the years pass, you might add an extra card or two with your own reflections or meaningful words from a Christmas devotion. 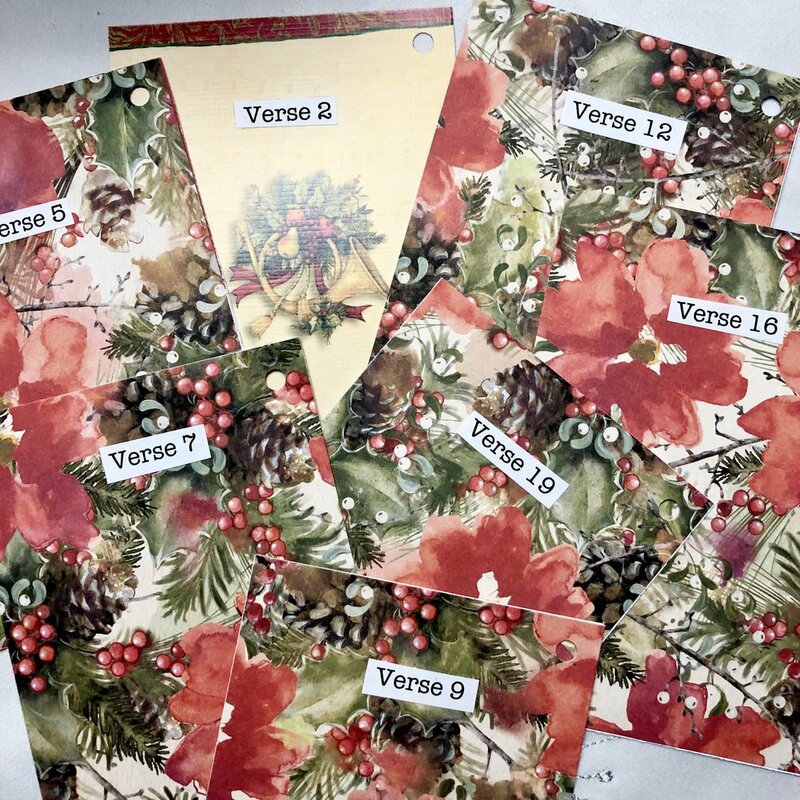 As you choose a card for each verse, may it be an enjoyable task to find an image to reflect the text. In the weeks before Christmas, you might find time to flip through the cards with your children - ask which one is their favorite or talk about how the words connect with what they see. It’s these processes of taking time, of slowing down, of hearing and seeing, and repetition that will help hide the Word in little hearts. The project text is sized to fit vertically on the card -- but the verses will all fit horizontal orientation as well. It’s really up to YOU how you want to put it all together! And finally, a closing prayer.